ProMaster Cargo Van trim, Bright White Clear Coat exterior and Black interior. iPod/MP3 Input, Back-Up Camera, Bluetooth, Tow Hitch. READ MORE!======K… EY FEATURES INCLUDE: Back-Up Camera, iPod/MP3 Input, Bluetooth, Brake Actuated Limited Slip Differential. MP3 Player, Keyless Entry, Steering Wheel Controls, Electronic Stability Control, Bucket Seats. ======OPTION PACKAGES: MOPAR TRAILER TOW GROUP MOPAR 7 & 4 Pin Wiring Harness, Class IV Receiver Hitch, WHEELS: 16 X 6.0 ALUMINUM, SPEED CONTROL, PASSENGER SLIDING DOOR W/FIXED WINDOW Deep Tint Sunscreen Glass, SECURITY ALARM, POWER FOLDING/HEATED MIRRORS, ENGINE: 3.6L V6 24V VVT (STD), TRANSMISSION: 6-SPEED AUTOMATIC 62TE (STD). 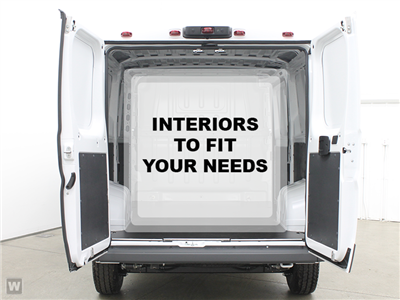 Ram ProMaster Cargo Van with Bright White Clear Coat exterior and Black interior features a V6 Cylinder Engine with 280 HP at 6400 RPM*. ======WHO WE ARE: Visit All American Chrysler Jeep Dodge of San Angelo today at 4310 Sherwood Way, San Angelo TX and experience our high-standard, pressure-free approach for yourself. As hundreds of drivers in the greater San Angelo area already have, you're certain to see the difference immediately. Plus TT&L and fees. Price contains all applicable dealer incentives and non-limited factory rebates. You may qualify for additional rebates; see dealer for details.